Whoooo? Your new owl buddy! During the holidays, everyone needs a little booty. Convenient, then, that Design Within Reach (1838 Columbia Road N.W.) is hosting their annual Holiday Booty Market this Saturday (10 a.m.-5 p.m.). The holiday market will be open to those who desire to navigate the "modern wonders" of the home furnishings store while shopping for last minute gifts from local artists and crafters. DCist has deemed this event the "winter version of Crafty Bastards," but you can ditch your coat and enjoy the genius that is central heating -- oh yeah, and free refreshments and music, too. Featured indie craft vendors will showcase a wide array of gift options at affordable prices. 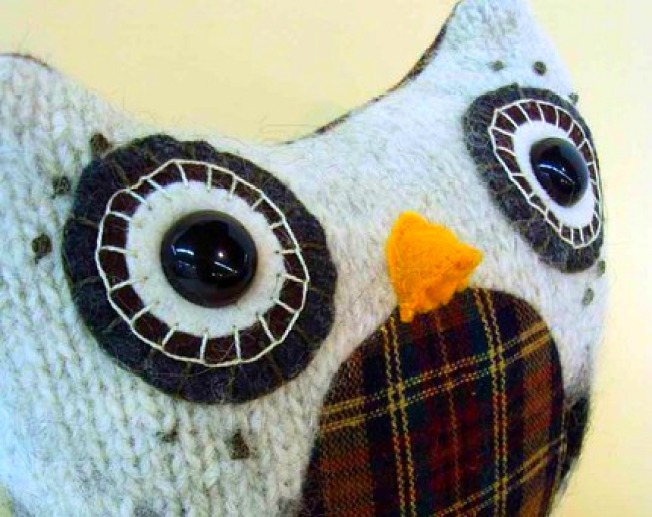 Featured items include hand-stitched coasters and placemat sets by This Chickadee, homemade soaps by Biggs and Featherbelle, recycled leather cuffs from Fisticuffs and plush animals made from recycled sweaters by Tigerflight (pictured). You can also find hand-printed items by illustrator Jaime Zollars and all manner of Zombie Plague Holiday items from Tina Seamonster. All Booty Market vendors have also been Crafty Bastards venders, so that should give you an idea of just how great this event should be. Admission is free, and the first 100 shoppers will score a goody bag, too.